No more flat pasta! With KitchenAid’s Gourmet Pasta Press attachment, your KitchenAid mixer turns into a pasta extruder, so you can quickly and easily create fresh pasta in any of six shapes: small macaroni, large macaroni, spaghetti, rigatoni, fusili, and bucatini. After you’ve mixed and kneaded pasta dough in your mixer’s bowl, slip the pasta press into the mixer’s power take-off. Your fresh pasta dough goes into the hopper at the top of the pasta press, then the powerful KitchenAid motor forces the dough down through whichever of the six metal extruding disks you’ve chosen. The shaped pasta comes out the bottom of the attachment. All you need to do is cut it to your desired length with the pivoting cutting wire and pop your pasta into boiling water. 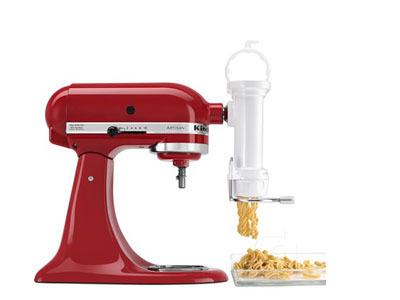 The Gourmet Pasta Press fits all KitchenAid mixers.